There's something special about a Marble cake.It looks good without any adornments and it tastes great satisfying people with varied taste buds.Something like,there's something for every one.It gives more pleasure to bake one at home and wait with fingers crossed when you cut into it and see the marbled effect.I love the different patterns we get each and every time we do the marbling.Sometimes,it is more a mix-up of patterns or sometimes they are evenly marbled. I remember making this cake a long time back when my in-laws were visiting.Ma-in-law loves it when I bake eggless stuff and gorges on it though she is not a big fan of baked sweets.And I love her for that! I followed a simple eggless Vanilla cake recipe to make this cake.Just added cocoa powder for the marble effect and added my favorite ingredient-Orange Zest to make the Cake extra special. Preheat oven to 170C.Grease a 6 cup Bundt pan or a regular 7' round/square pan. Sift together flour,milk powder,baking powder and baking soda,keep aside. Pour hot water on cocoa powder and mix well to form a paste,let it cool. Add the flour mix and milk alternately,starting and ending with flour to get a smooth batter. Transfer a little less than half the batter to a pan.Add the cocoa paste to it and mix well,add the orange zest. Add vanilla to the remaining batter. Pour all of the white batter into the prepared pan.Top with the chocolate batter.Swirl the batter using a table knife-do not over do it. Bake for 40 minutes or until a toothpick inserted comes out clean.Cool in the pan for 10 minutes,then unmould and finish cooling on a rack. 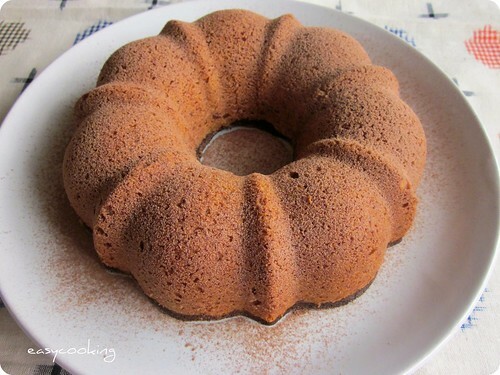 Dust with cocoa powder on top and cut into thick slices. What a perfect bundt u have turned out! 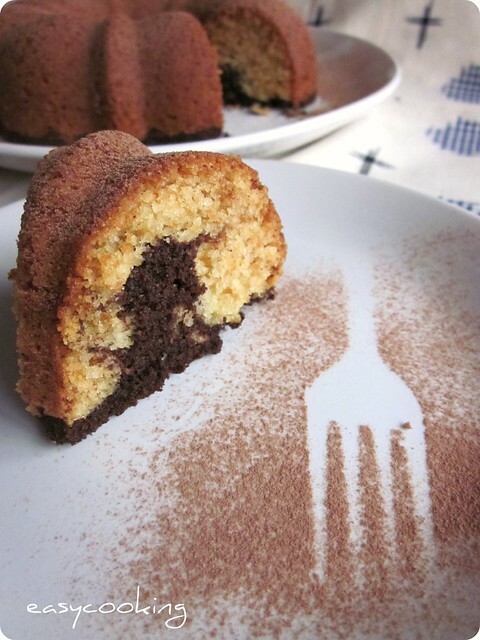 Absolutely - A marble cake is a dressed up one all in itself and when its a bundt all the more so...chocolate and orange cake- it can't get any better than this! was wondering if I could use hot cocoa mix instead of cocoa powder..I have lots of hot cocoa mix in my pantry ..
Love the fact that its eggless! Nice looking cake! love ur eggless baking versions. very helpful for people like who don't like the smell of eggs in the cakes. loved your cake very much. soon going to try it out. Angottu ponnalonnu alochikuvaaaaaa..cake thakarppan divi..
Any cakes i will love it..urs makes more tempting..love the color..n its so soft..
Divya, These look lovely. Gr8 Eggless recipe. Marble cake always grabs attention..I cant beleive that uve made an eggless version cuz eggless baking recipes without egg replacer are sooo hard to find..Bookmarking it!!!!!! Wow wat a super spongy,gorgeous and elegant marble cake..
lovely wonderful and delicious marble cake. Wow.. That's one yummy and delicious looking cake. Lovely pics. Wow Divya, I loved the way of presentation and I also loved the sprinkled fork effect. Hmmmm yummy and the cake looks moist. hi.............am Dr Tomy and i am a huge fan of ur cakes.......made several and a lot more are in the list to be tried.......i cannot understand the fascination for eggless cakes.......i seriously cant............but it looks lovely.......i had once made an eggless cake using curd and baking soda.....it was totally fab as well.....but gimme cakes with eggs and no butter any day!!!!! Looks so beautiful. Can I have a slice please? Luvly cake...And happy to know its eggless..
Oh I love marble cakes!And I think any cake baked in a bundt pan tastes just a little bit more special! One more recipe to add to my eggless collection- Thanks Divya! I'm loving this! I've been wanting to try more eggless cakes as a few of my friends here don't eat eggs and I'd love to bake for them! So, bookmarking this to surely try! Thanks! Yummy cake, it really waters my mouth just seeing the snaps of cakes. i am very eager to try out the recipe. Hope its will also be as yummy as yours. just curious....why do we have to add hot water? Anon-adding hot water to cocoa powder brings out the flavor of the cocoa powder and ensures it mixes well with the batter without forming lumps. I baked this in a bundt pan yesterday. By the way why should we add milk powder ? 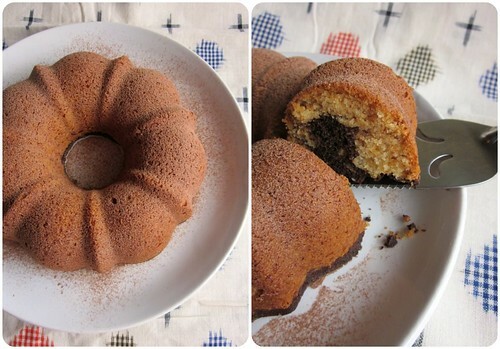 I tried this recipe yesterday and baked it in a bundt pan . it was great.and moist too I replaced butter with nutralite,..
By the way I have a doubt why should we add milk powder ? How did you end up with such a crust? Meghana,I am not sure what you meant.Did you try out this cake and get any different results? Thank you for the recipe. My cake turned out great. without addition of cocoa powder and orange zest can we make the plain vanilla cake this way...ofcoarse using all above ingredients? Could you please tell me what would have gone wrong. I've tried several other recipes from your blog and they never failed me till now. What is cup measurement I mean 200ml or 250 ml?